During any stormy day or any gorgeous sunset, I always find myself wondering what the Moran Towing tugboats might look like. Well, during the first blizzard of 2011…I made a point to endure some pretty ridiculous wind on Ceres Street and strolled on over. This is a familiar scene revisited from a winter storm just about one year ago….only 6 days off. I was eager to test out my new Zeiss lens…and it didn’t disappoint. 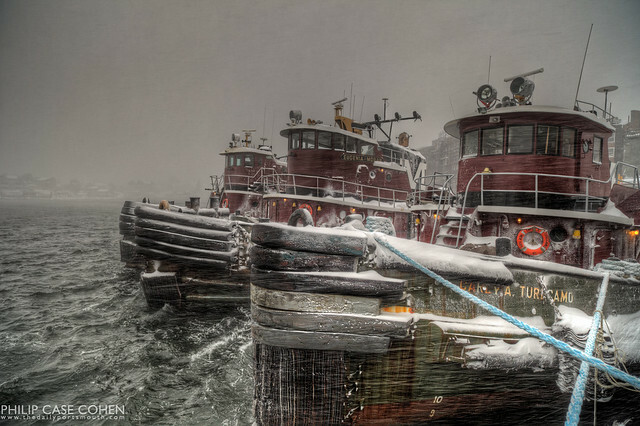 It’s been a while since I’ve featured the tugboats, so it felt like time to share another dramatic waterfront scene. Just look at the intensity of that water ready to splash the hulls of the tugs, and the thickness of the snow in the air…so thick that you can barely make out the Kittery, Maine waterfront on the other side of the river.